Most husbands have experienced being volunteered for stuff, but I did not realize there was a word for it until my sister said she voluntold her husband to do something. I am not sure whether voluntold has made it into any of the myriad of dictionaries out there, but it is sure to catch on regardless of whether my sister made it up or not. Who knows? In a few years, it might even make it into the Official Scrabble Dictionary. However, at this point in time, I am just going with the notion that my sister made up the apropos word for all wives to use. 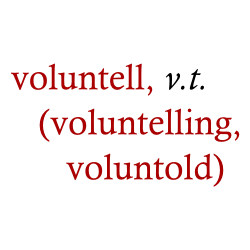 VOLUNTELL – v.t. to volunteer another person (usually a husband) to do a job. voluntelling, voluntold. Unfortunately, voluntell is a sexist word. Women will believe only they have the right to use it. 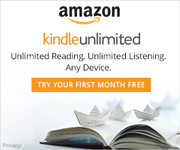 Even so, I can imagine teachers asking students to use the word in a sentence. I can even hear years later when George is at his church’s men’s meeting lamenting, “I voluntold my wife to help out at the church bazaar, but apparently only wives can voluntell their husbands and not the other way around.” Of course, all the men would groan and sadly nod in agreement. I do not remember exactly what it was that my sister was voluntelling my brother-in-law to do, but I am sure she did not anticipate me writing about her nifty word. At any rate, I need to end this here before I get into too much trouble. Besides, I think I hear my wife. I need to hide before she reminds me what it is she voluntold me to do.